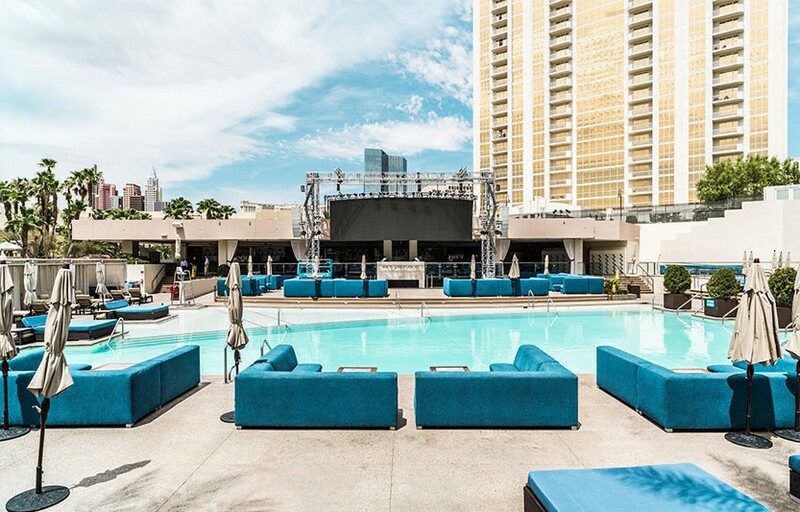 A privileged playground for partygoers, glitterati, and celebrities, Wet Republic at MGM Grand combines the best elements of Vegas nightlife with supreme poolside amenities to create the ultimate daylife experience. The unrivaled hot spot delivers a variety of experiences for its guests, whether they want to chill over cocktails in the poolside lounge, relax in exclusive VIP bungalows, or bask in the party scene on the main pool deck or cabanas. The 54,500-square-foot pool at the MGM Grand just underwent a $3.574 million remodel to 18,400 square feet of the space. Last year, the pool debuted an expanded DJ booth, an upgraded LED display, extended bar and new furniture. The latest renovations added six new VIP bungalows equipped with furnishings, TVs and misting fans all equipped with three private plunge pools. New restrooms and shower facilities as well as an extended shade area have also been added. 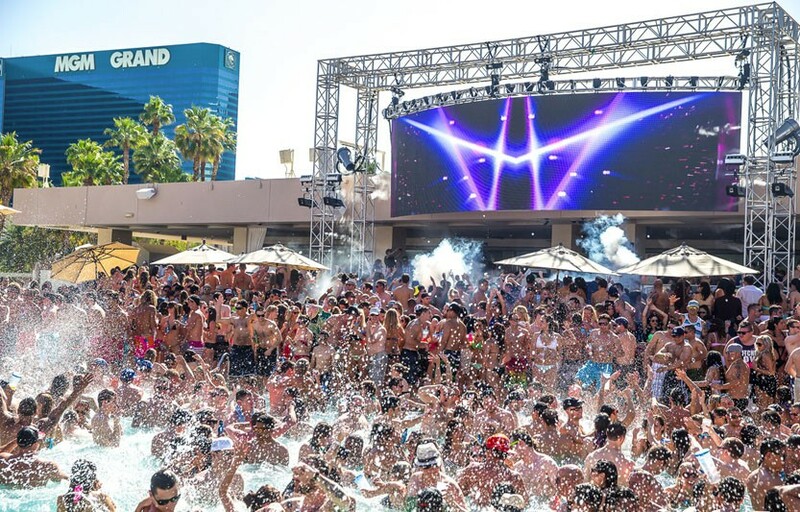 Wet Republic has some of the most popular DJs (Calvin Harris, Tiesto). Tables and cabanas at Wet Republic are on the expensive end as far as dayclubs go. Tuesday nightswims at Wet at Night during the summer are extraordinarily fun – bring your swimsuit and get in the water! Where is Wet Republic located? Wet Republic is located on the grounds of the MGM Grand hotel and casino. How much is cover charge / general admission at Wet Republic? Cover charge at Wet Republic is usually around $30 for girls, $50 for guys. It really depends on the talent though and for big name DJs (Calvin Harris, Tiesto, etc) expect the price to be higher. How long will I have to wait at Wet Republic? Average wait times are around 1-1.5 hours on Fridays and Saturdays. Thursdays waits are generally shorter. When is Wet Republic open? Wet Republic is open Thursday through Monday from 11 AM – 7 PM. What are the best days to go to Wet Republic? Friday and Saturday are good. Tuesday nightswim is also a great choice. What is the dress code at Wet Republic? How much do drinks cost at Wet Republic? Mixed drinks / cocktails start at $18, Beers $12, Shots $15, bottled water $10, and Bottles start at $700. Resident DJs for 2019 include Tiesto, Zedd, Martin Garrix, Steve Aoki, Cash Cash, Lil Jon, Party Favor, Loud Luxury, Fergie DJ, Mark Eteson, DJ Shift, Jeff Retro. Where can I find an list of upcoming events / DJs at Wet Republic? You can download the Discotech app to see upcoming events, get on guestlists, book tables, and buy tickets. You can also visit Wet Republic’s website for a current list of events. What kind of music do they play at Wet Republic? Wet republic primarily plays electronic dance music. When does Wet Republic open for the summer? When does Wet Republic close for the summer? 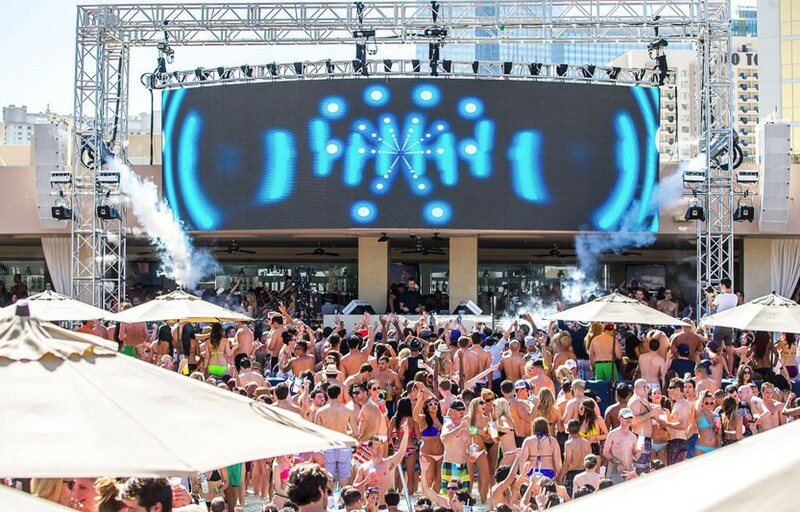 Wet Republic’s 2019 summer season usually starts sometime in March and ends in late October / early November. Exact dates vary year to year, depending on weather. We’ll post the events on our app as soon as they become available – check our app for updates! In which hotel is Wet Republic located? Wet Republic is located in MGM Grand. Looking for VIP offers and comps at MGM Grand? Check out URComped.com to find a Casino Host at MGM Grand.